Following his election, Mayor Drew Dilkens called for a 20 year strategic plan for the City of Windsor resulting in the hashtag #windsor2035 popping up on Twitter. I have decided to weigh into this discussion of what Windsor should/could/would look like in 2035. This post will be the first in a series in which I attempt to tackle different issues that Windsor-Essex faces and how we can deal with them as we move to 2035. Before I get to those posts, I do take issue with the concept of long term strategic plans, particularly the 20 year time-frame. Yes, there is value in planning for the future whether in business, government or your personal life. One should be able to plan to have income to pay their bills, insure that they are not living beyond their means, set aside funds for sudden and unexpected expenses and ensure savings and payments for large scale purchases that can’t be made today. Next Monday (July 6) a presentation will be made on a draft for the strategic vision to council for discussion. As you would expect, this document is very high level and lacking specific targets or outcomes beyond general pleasantries of tackling the regions problems and outlining that five 4 year strategic plans of action that are yet to be determined. Looking back at past strategic plans, in my opinion, they too suffered from a lack of concrete vision. Plans such as these are called “tools of vision” which means that they are concrete enough to guide action but vague enough to allow deflection in the face of failure. The result of this lack of defined vision meant that prioritization was weak and the failure to set benchmarks for each goal gave wiggle room as time past. Although the report cards that were presented to council did provide some benchmark and track trends over time, the lack of initial concrete goals created a gap in accountability, while the trends that were presented were given largely without broader context or analysis. 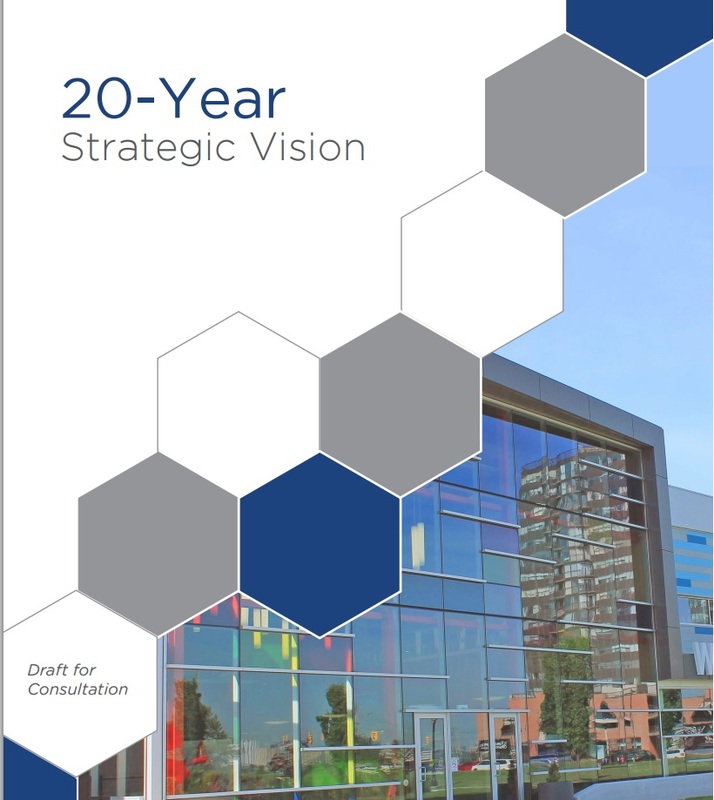 This is the first challenge with the Windsor 2035 vision, the document that is being discussed is almost entirely a political one, with the value existing so long as those who pass it hold power. Each 4 year sub-plan will have to navigate its own way through administration and council with no guarantee that these plans will arrive in a state that be practical to implement or not undermine future development for short term gains. At the same time the subsequent plans will have to balance changes in council ideological positions while theoretically ensuring that each part of the city receives equal treatment. Although such documents tend to be guided by a more stable bureaucratic foundation (administration says what is and isn’t feasible) if the political leaders and the people who elect them lose interest or macro-level circumstances change they quickly become futile exercises. The second problem is that we have no idea what our city will look like in 2035. Look back 20 years to 1995, (I was 9 years old and living in Tillsonburg, Ontario in case you were wondering) think about about Windsor-Essex and ask yourself if councilors and residence could have predicted what our region would look like today. In 1995, the Windsor was still home to the Big 3 and was Canada’s clear automotive capital (GM is gone now and Ford could be heading out the door in 2017), the internet still took a phone line to log on, Apple only made computers, Facebook was the picture of on the back of a book and needing a passport to get across the border was an laughable hassle. I honestly couldn’t tell you what life was like in Windsor-Essex County back then, but from data on incomes, employment, health, demographics etc. things have changed dramatically. To claim that we will be able to predict what sort of economy, demographic make up, community climate or political culture will be present in 2035 is remote at best. As a result of this uncertainty, any number of shocks could derail the inspirational goals of this document creating a negative legacy of “what if” or “I told you so” and those goals that are likely to still be applicable in 2035, are going to be the ones that are so generalizable, economic development for example, that they will be priorities into perpetuity. The third issue comes from the fact that our region, despite being made up of several distinct municipalities is too interconnected to plan independent from one another. From schools to health care, jobs to infrastructure; pee-wee sports to bike trails we live in a single region yet it is governed separately. This divide is part of the cause and potential solution too a number of the challenges that Windsor faces. As a result, the success or failure in many ways of Windsor’s 20 year plan will be dependent on what is happening in LaSalle, Tecumseh and region as a whole. The fact that we compete for provincial and federal grants, attracting business and being places for people to live means that for a variety of reasons that are beyond our control, we could fail at every single planned goal in a potential 20 year plan. Maybe I’m just a cynical, but a 20 year planning exercise seems largely redundant. Many of the goals outlined in the draft document (economic development, keep young people local and planning for the transition in the public service) are common sense and have been well reported on in the media and other sources. Since this process is underway, I would challenge Council to ensure that whatever goals they outline in the 20 year vision, to have clear benchmarks set for each of the 4 years plans going forward. That way voters are able to see if the goals that council has set, are aligned with their priorities and hold those councilors to account for the successes and failures that occur. My reservation set aside, in each of the subsequent posts on #Windsor2035, I will discuss an issue/topic that is important for Windsor and the broader region. In each post I will present what I deem to be a pressing topic/trend/issue; I will editorialize and justify a plausible scenario; before providing a conclusion with a course of action or word of warning for our City to heed moving forward. In the final post of the series I will offer some specific policy ideas that could be adopted to help Windsor achieve its goals by 2035. I will post links here as the subsequent blogs are completed, and I may add to this list if there are any requests or am inspired as I write on another topic.